When I was a kid, my mom would often bake Nestle Tollhouse chocolate chips cookies with me and my sister. Sometimes we would throw in Rice Krispies or Cornflakes (we were a non-sugared cereal house) to change things up a bit and give the cookies a slightly different texture. To us, that made the cookies even more special. 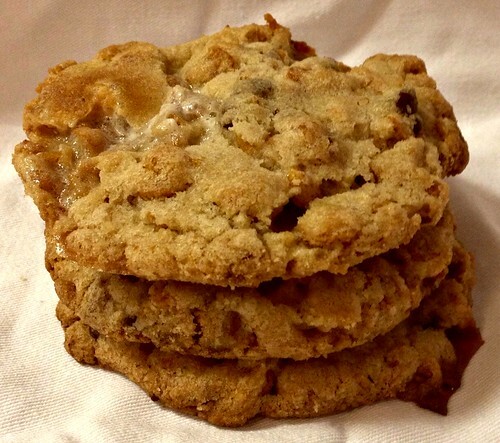 Well, these cookies take my mom’s Rice Krispies chocolate chip cookies to a whole new level. A ridiculous chewy, sweet, hint of salt, bit of crunch type level. In fact, they taste like an ooey-gooey Rice Krispies Treat and chocolate chip cookie mashup. Seriously. These are the kinds of cookies that will make your coworkers hate you. In a good way. Pour the cornflakes in a medium bowl and crush them with your hands to one-quarter of their original size. Add the milk powder, sugar, and salt and toss to mix. Add the butter and toss to coat. 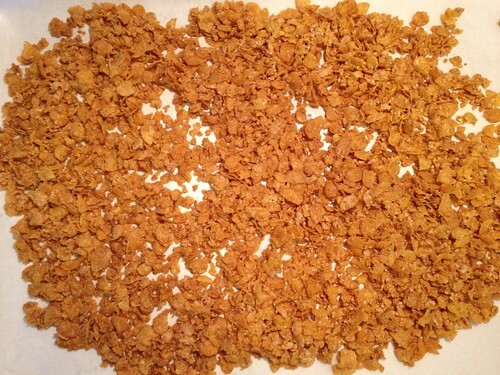 As you toss, the butter will act as glue, binding the dry ingredients to the cereal and creating small clusters. Combine the butter and sugars in the bowl of a stand mixer fitted with the paddle attachment and cream together on medium-high for 2 to 3 minutes. Scrape down the sides of the bowl, add the egg and vanilla, and beat for 7 to 8 minutes. Reduce the mixer speed to low and add the flour, baking powder, baking soda, and salt. Mix just until the dough comes together, no longer than 1 minute. Scrape down the sides of the bowl with a spatula. Still on low speed, paddle in the cornflake crunch and mini chocolate chips just until they’re incorporate, no more than 30 to 45 seconds. Stir in the mini marshmallows just until incorporated. Using an ice cream or cookie scoop (I used my large OXO cookie scoop), portion out the dough onto a parchment lined sheet pan. Pat the tops of the cookie dough domes flat. Wrap the sheet pan tightly in plastic wrap and refrigerate for at least 1 hour, or up to 1week. Do not bake your cookies from temperature–they will not hold their shape. Arrange the chilled dough a minimum of 4 inches apart on parchment or Silpat lined sheet pans. Bake for 12-14 minutes. The cookies will puff, crackle, and spread and should be browned on the edges and just beginning to brown toward the center. Leave them in the oven for an additional minute or so if they aren’t and they still seem pale and doughy on the surface. 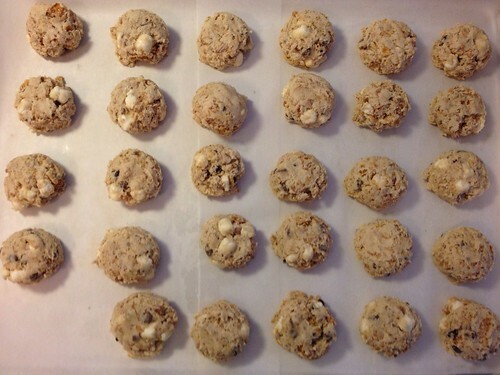 Cool the cookies completely on the sheet pans before transferring to a plate or to an airtight container for storage. At room temperature, the cookies will keep fresh for 5 days; in the freezer, they will keep for 1 month. Recipe adapted from the Momofuku Milk Bar cookbook. These sound very interesting and look yummy I will have to give them a try!